Before: Reena Montero has loved Sawyer LeGrande for as long as she can remember: as natural as breathing, as endless as time. But he�s never seemed to notice that Reena even exists�until one day, impossibly, he does. Reena and Sawyer fall in messy, complicated love. But then Sawyer disappears from their humid Florida town without a word, leaving a devastated�and pregnant�Reena behind. After: Almost three years have passed, and there�s a new love in Reena�s life: her daughter, Hannah. Reena�s gotten used to being without Sawyer, and she�s finally getting the hang of this strange, unexpected life. But just as swiftly and suddenly as he disappeared, Sawyer turns up again. Reena doesn�t want anything to do with him, though she�d be lying if she said Sawyer�s being back wasn�t stirring something in her. After everything that�s happened, can Reena really let herself love Sawyer LeGrande again? In this breathtaking debut, Katie Cotugno weaves together the story of one couple falling in love�twice. 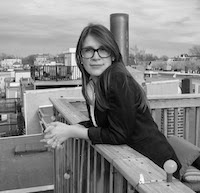 On it’s surface,�How To Love by debut author Katie Cotugno does not seem like a me sort of book at all. Typically, I balk at books that have to do with babies or pregnancy. Lately, though, I find that I am not quite so anti-baby. Maybe I am growing up? Alas, I could not resist the siren call of�How To Love and it’s beautiful cover, and so accepting a blog tour invitation, I plunged right in. To my great surprise, I actually really liked the book, enough that I am willing to recommend it to people who hesitate at small children aka people exactly like me. 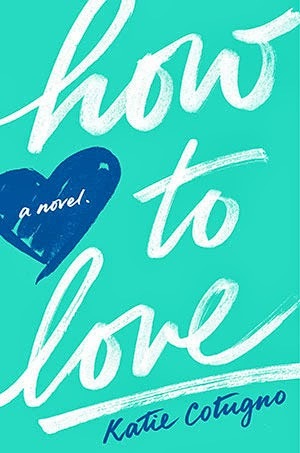 How To Love is about a precocious, guarded teenager named Reena who falls in love twice with the same boy, Sawyer LeGrande, at different points in her life. The first time, she is in high school and Sawyer is exciting, new and different. This is Before he runs away and out of her life for two years. The second time is After Sawyer has returned to their small town in Florida. He’s changed, and so has Reena. She’s got a new boyfriend, Aaron, and a child, Hannah — who was fathered by Sawyer. Basically, the book contains a dual storyline, and as readers we go from the very beginning up to what comes after Sawyer’s return. Really, this book is just so damn human, it’s got all the emotions that one could hope for when reading. I think Cotugno is very talented as an author. I have nothing in common with Reena, but I felt as though I could relate to her and while I was reading her story I just felt all this empathy for her character and what was happening. I felt drawn into Reena and her personal situation. You see, she’s loved Sawyer for pretty much for ever. Then, her best friend wears a tank top and Sawyer is all over Allie. Reena never lets them see her sweat though, and keeps it all inside. She’s very much a guarded sort of girl and I feel like I don’t see that a lot in characters — usually the characters I read have their hearts on their sleeves. Not so with Reena, her walls are impossibly high but it never comes across as annoying or as a cliche. There are moments where she’s portrayed as being a terrible friend and a crappy girlfriend and rather than me be annoyed with her, I just felt like the book was so honest with that portrayal of a person and their faults. I liked Reena despite her faults. This is totally terrible and I know some people will disagree with me, but I just did not like Sawyer. I did not swoon over him at all. Sure, there’s some physical romance scenes and that little bit of heat is always fun. HOWEVER, I could not 100% get behind the romance in�How To Love. I felt like Sawyer was one of those manic pixie dream girls, but a boy. He’s all free spirited and in and out of Reena’s life. He sleeps around. He does drugs. He’s in oh so much pain. I guess you could call him a ‘mysterious loner dude’, to use one of FYA’s terms. But, meh. I just found him really annoying and not really all that stable. I think that I would have liked Reena with a different guy better. And I know other people will disagree with me, and that’s fine, but for me, personally, I just was not feeling the whole Sawyer thing. Like, I get why Reena is into him because he represents someone without expectations and there’s not all this pressure on her with him. But yeah, just meh. I really just loved the writing in Katie Cotugno’s How To Love. I liked the�use of Before and After narratives to showcase the two falling in love twice — even if I didn’t care for the romance. Hell, if my LOVING the book despite the romance isn’t a testament to this book’s writing, I do not know what is. Cotugno’s prose was gorgeous – and evocative. I know those are like cliche words, but really, I just wanted to bend over the pages. The voice in the books really captures an old soul caught in a young body. I just thought Reena’s voice felt mature and real and authentic and I loved it. I can’t recommend�How To Love enough, it’s fantastic despite a romance I didn’t love, despite a small child, and despite my initial reluctance. READ THIS BOOK. Because I have an ARC just laying around, I thought I would give it away. US Only. Enter using rafflecopter! I just finished this and feel much the same way. I didn’t like Sawyer, but loved the book. I don’t tend to like “typical” teen romance books — bad boy/good girl stuff. But this was so much more. I’m posting my review next week. Great stuff!